string(1213) "Resource Centre > Uncategorized > Anti-Trafficking Risk Management Best Practices & Mitigation Considerations Guidance"
Contractors are expected to be committed, proactive, and forthcoming in their efforts to address and reduce the risk of human trafficking in their operations and supply chains. At the same time, it is recognized that not all contractors are similarly situated and some, such as those with large supply chains, may face more challenges than others in meeting their responsibilities. In addition, not all risks are equal in their impact. 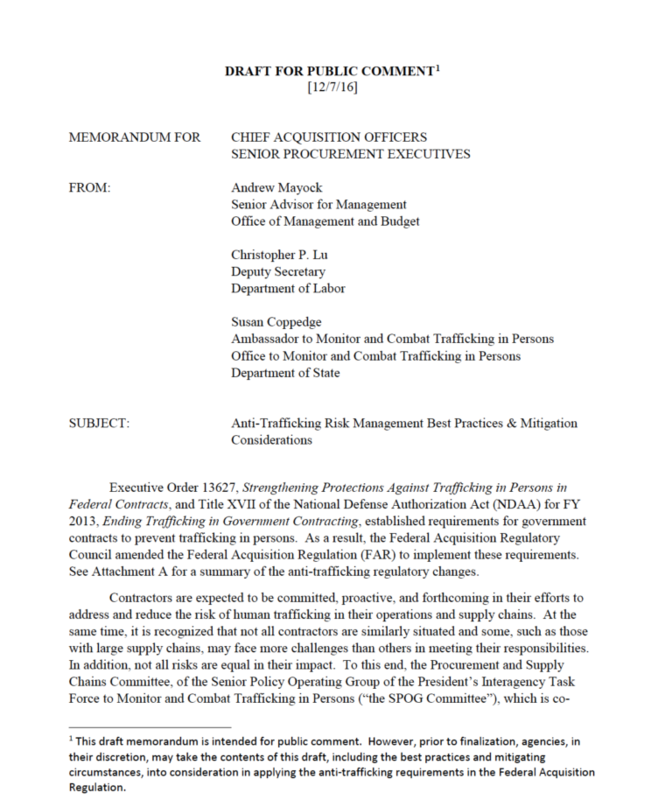 To this end, the Procurement and Supply Chains Committee, of the Senior Policy Operating Group of the President’s Interagency Task Force to Monitor and Combat Trafficking in Persons (“the SPOG Committee”), which is co-chaired by the Office Management and Budget (OMB), the Department of Labor, and the Department of State, developed a set of best practices and mitigation considerations to help contracting officers determine if a contractor is taking adequate steps to meet its anti-trafficking responsibilities under the FAR. See Attachment B.